I’m a soul inhabiting a body in an exciting journey on this planet called Earth. Care to come along vicariously for the ride? I’m also an Artist, a Woman, a Mother and an Entrepreneur. My opinions are strong as is my Passion for Life, Health, my Art, and my Family. Awesome! Since going vegan, I’m a teeny bit sad to say goodbye to my Docs, but the trade-off is wearing Cons… Win! Congrats on the vegan turn. I’m sure your Docs were even grateful. Look what I did….http://lamentsandlullabies.wordpress.com/2012/03/10/two-fer-award/ Because you are both versatile and inspiring, though I think you might have these already. Thank you for subscribing to my blog i will do the same for you, and i hope you enjoy my posts. 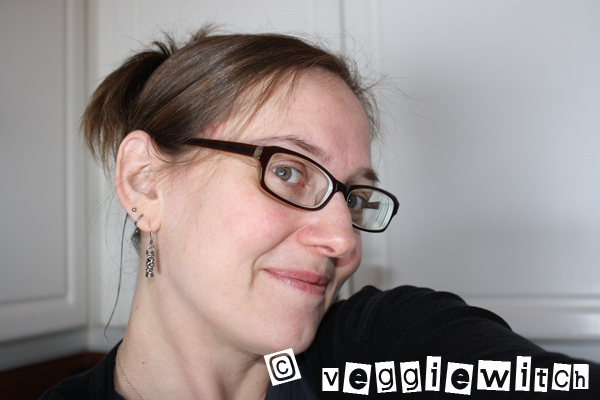 PS Love the name Veggiewitch!!! Hooray, thank you, and welcome! Likewise, my friend. congrats on being fp’d. I may not have found you otherwise. Glad that I did. I love your header so much!!! I really enjoy reading your blog, so I nominated you for The Very Inspiring Blog Award! You can check out details of it on my blog. Keep up the great work! Hi Veggiewitch. Thanks for likon my front page. I’m now following you. I hope you’ll follow me. I look forward to reading more on your blog. Awwwwwe! Thank you sooooo much! I did a funny Blog Awards Show on Queen’s end. resamcconaghy.com Yes, I nominated you for an Award you might already have. Feel free to accept or not. I’m easy going about it, and I love your Veggie Blog. Thanks for dropping in the other day. It was an exciting visit for me. Awwwe! YOU are the sweetest! Hello, I just wanted to say I enjoy reading your posts :), and I hope you don’t mind but I’ve nominated you for the Lovely Blog Award. By the way, if you are unfamiliar with the awards thing here at WordPress, you can drop me a note if you like. That is very kind of you. Thanks for liking my post on Black Box Warnings about my son and our adventures in medicating (NOT) him. I have a parent in nursing care. It was a difficult road finding a place for him to live as it was impossible for him to live with any of us. We did find a wonderful dementia care facility (he has Lewy Body dementia with Parkinsonism.). Good luck to you. I nominated your wonderful blog for an award. enjoying your space very much–you’re amazing! Appreciate your Like on my Little Debbie funny names post. Guesting at Blog of Funny Names has been a great way to find awesome bloggers such as yourself :-) Kudos to you for all you’ve been through and all you’re doing now. sweet blog. I invite you to check out my blog: http://veggiechica.com for Latin inspired vegetarian (and vegan) dishes. Hope you enjoy. I’m quite pleased with the inmotfarion in this one. TY! My name is Denise, but I respond to Mum, Miss Boss and Veggiewitch. I am a Mother, Artist, Activist, and Warrior. I post often, and often with passion. Can Aluminum in Vaccines Cause Autism?